Choose from our centre fold options of 1 metre width rolls which open to 2 metres or our 1.5 metre rolls which open to 3 metre widths. Polythene Sheeting Roll for wrapping, pallet protection or as decorating dust sheets for the protection of furniture and carpets whilst painting. In addition to making perfect polythene dust sheets, these rolls are also popular with businesses for use as secondary glazing during cold spells and even as plastic mattress protectors in care homes. We can supply numerous other grades of plastic sheeting rolls for a vast range of uses - simply call us on Free Phone 0800 630 0072 to discuss your requirements. BENEFIT FROM FANTASTICALLY LOW PRICES ON THESE ROLLS AND OTHER POLYTHENE PRODUCTS! THE PRICES SHOWN INCLUDE VAT & DELIVERY TO NEARLY ALL UK MAINLAND ADDRESSES. 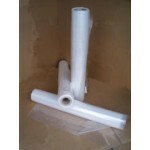 Scroll down the page to buy pre-cut polythene sheets.